This book includes Sylvia Woods' multi-level arrangements of 50 of the best-known traditional Christmas carols, with their lyrics. Each piece has two arrangements: an easy version, and one that is more difficult. This book is a popular Christmas standard for both beginners and professionals. All pieces include fingerings and are in C or sharp keys. 96 pages, spiral-bound. See complete list of carols below. If you buy both the book and CD, you will automatically receive a $2 discount in your shopping cart. If you purchase this book along with Sylvia's Chanukah Music for All Harps book, you will automatically receive a $2 discount in your shopping cart. If you purchase both books and the CD at the same time, you will automatically receive a $3 discount in your shopping cart. 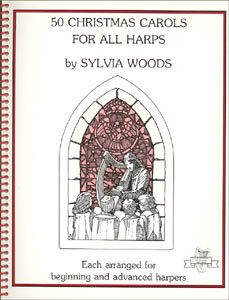 The Companion CD includes the pieces from this book and also from Sylvia's Chanukah Music for All Harps book. The Companion CD assists harp players learning the pieces in these books. Since many of you will want to "play along" as you are learning, Sylvia has recorded most of the pieces slower than they are usually played, and as "straight" as possible, with little or no expression or rhythmic variations. In the books each piece has two arrangements: (A) an easy version, and (B) one that is more difficult. On these recordings Sylvia plays the "B" versions. Since the two versions can be played as a duet, you can play either version along with the recording. The pieces are in the same order as in the books, with the Christmas pieces first, and then the Chanukah ones.